Yesterday we talked who, what, where, and why for protein powder. Today I’m talking the how! 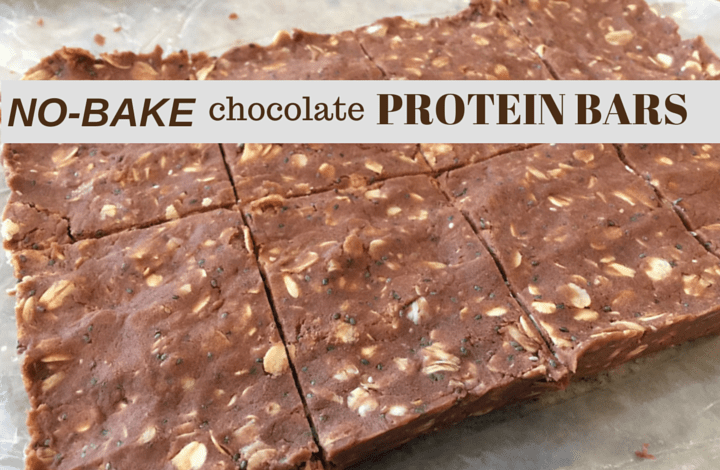 How-to enjoy protein powder in tasty, no-bake chocolate protein bars. Buying protein bars in the store can make your grocery bill add up! It’s easier than you think to make a homemade version— I was inspired by this recipe. I can pronounce every ingredient in these protein bars- a healthier version? Maybe so! Hey Joey, get your hands outta my photo shoot! The bar batter will have the texture of oatmeal cookie batter! But the finished product tastes sort of like a chewy brownie… the best of both worlds?! Portioned out in individual servings! Combine the milk, peanut butter, and honey in a large bowl. Microwave for 15 seconds. Stir and microwave for an additional 15 seconds. Line a 8x8 pan with parchment paper and press the mixture evenly in the pan. Freeze for at least 15 minutes. Cut into bars [I made 8]. If you’re not into making your own protein bar, do you have a favorite store-bought brand? « Protein Powder: Is Supplementing Necessary? 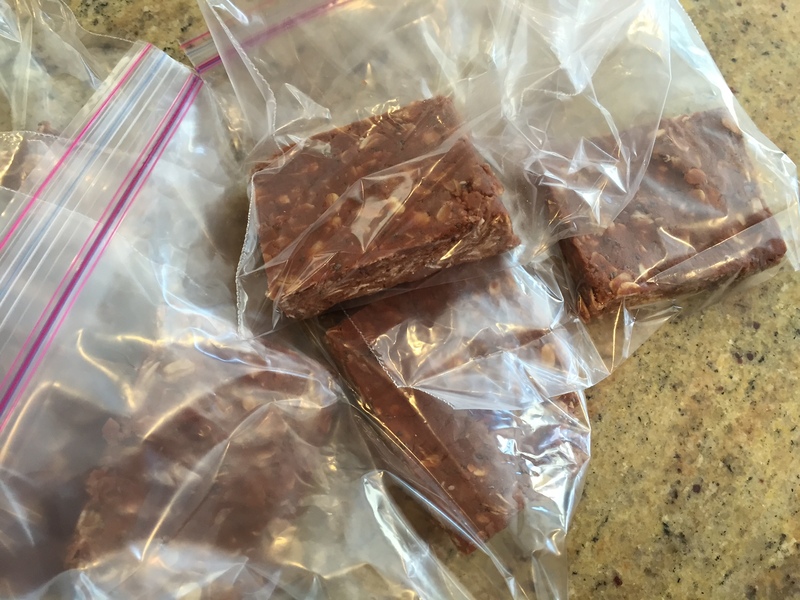 I just made my own protein bars for the first time last week and I can’t believe how incredibly easy they were! These look scrumptious, you can never go wrong with chocolate anything! I haven’t calculated those out just yet! Please send me an email and I can get that over to you this week. I’ve been looking for a grab and go protein-packed snack recipe for my guy who spends long hours at the hospital (and they don’t give them breaks to eat… :O) Pinning to make! These protein bars are so awesome to have around when life gets crazy. Haha looks like we share the same problem – we shall never run out of pb 😉 Love seeing the lil’ hand so precious!! I might run out of milk and bread, but NEVER PB!! Thanks Min xo. These look and sound awesome! Being about to pronounce every ingredient in your food is always a plus 🙂 And I loved the photo bomb- so cute!! He’s always sneaking into my shoots lol! OH this is so easy and sounds SOOOO good!! I’ve got to try this! These look amazing! I am going to pin to my clean eating board! 🙂 I have a bunch of chocolate protein powder and Im too lazy to make shakes, so this is perfect. Was the protein powder you used sweetened? I have some (mildly) chocolate flavored brown rice protein. I’m wondering if I would need to add a little more honey or some coconut sugar if I use that? Mine wasn’t. But it still tastes fairly sweet to me! Can’t wait to make these with my daughter – do you think I could swap in regular whey powder and cocoa powder for the chocolate protein powder (which I don’t have)? Could you let me know how much cocoa powder to substitute? I have vanilla protein powder I’m trying to use up before buying more. I’d add 2 teaspoons and try it to make sure it’s chocolatey enough for you! Love these! So easy and healthy! These look great! The one thing I can’t stand about store-bought protein bars are their tough texture, I think I’ll need to give these a try! These have a semi-silky smooth texture. My favorite! You had me at chewy brownie. Definitely making these this weekend! These look so yummy and I have all the ingredients!! you had me an no bake… but then you went and added CHOCOLATE! yes, sign me up! As a fellow mom, RD, recipe reduxer and protein bar maker/lover, these definitely caught my attention. They look delicious and I love the simple, healthy ingredients used. Also love your leftover recipe redux post too! Do you know what the actual nutritional info is on them? They sound great! Do have any general nutrition information on these bars? Would love to add these to my fitness app. I understand different protein powders and peanut butter could vary the information. HI, I tried these last night and they turned out so slimey and gooey. The taste is great but the texture is so bad. Any ideas what I did wrong or how to prevent that? What kind of protein powder did you use? I have brown rice protein powder which can be chocolate flavoured too and was thinking of using with this recipe! Oh yum! 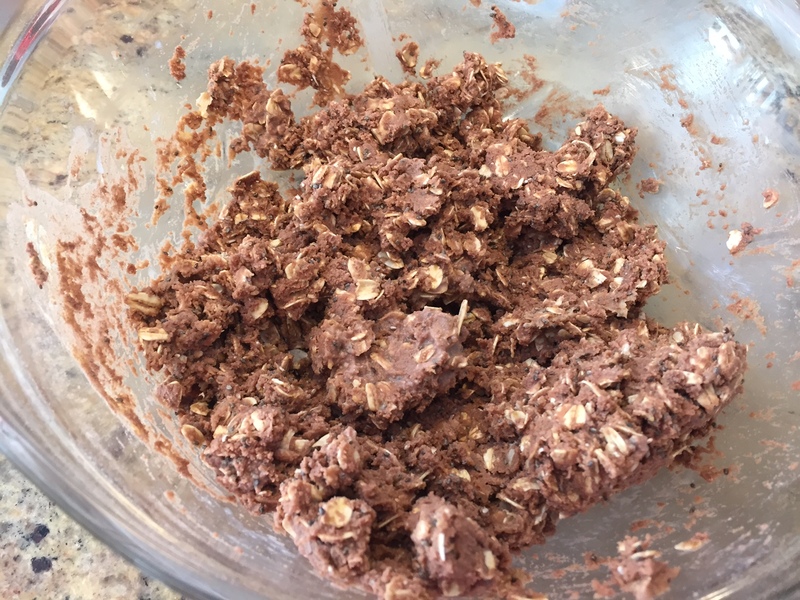 A healthier replacement for my no bake cookies that I love! Don’t know about texture yet because I just placed them in the freezer but oh, they taste divine! Just curious, when you two scoops of protein powder, how much is that exactly? Thanks. It’s likely about a cup! I hope that helps! Do you have the nutrition analysis for this? I’m curious how many grams of carbs, proteins and how many calories each serving has. I’ll see if I can get that for you! Could I use steeled oats with this recipe? I have the exact problem of eating properly and thought I’d give home made protein bars a try!! Hi! I tried these last night and they taste great but even after putting them in the freezer overnight, an hour after taking them out they are mush… has anyone had a similar problem? If so recommendations to making them hard would be great. thx! Hi Tamara! Thanks for your comment and for trying my recipe! I’ve made them multiple times this way and they’ve turned out for me. Are you using a natural peanut butter? Perhaps it’s a difference in protein powder too. I’d suggest adding more oats! I use Jiffy PB so not sure if that makes a difference too. I have been playing with this recipe because I love it so much. I have been adding ground raw pumpkin seeds, chopped walnuts, chopped pecans, ground flax seed, whole grain rice crisp cereal and in addition I replace the milk with extra virgin coconut oil. I have also made a few batches with ground coffee!!! I also use local honey instead of store bought as it is just another healthy / allergy benefit!! Next I’m wanting to try some fresh vanilla!!! Whoop whoop!! Sounds awesome! Love that you are being so creative. I love the coffee version. I’ll need to give that a try next! I just happen upon your website thru Pinterest, I’m trying to get myself back to a healthy state by redoing my eating habits. I was on a low card regimen for a year and found that fixing my own food was so much better than buying, I agree when you purchase items with ingredients you can’t pronounce you need to stay away from it, all the preservatives that are added into todays’ food is ridiculous!! I was reading some of the reviews and they all seem to enjoy but for the ones that said it came out mushy do you think instead of changing the protein powder they could as you stated not add as much milk, maybe do 1/4 cup milk and then add a couple or 3 tablespoons of virgin coconut oil, that would for one help to solidify the recipe. I just made these and can’t wait ti try them! I substitued sunflower seed butter for the peanutbutter and used coconut milk. I also added pumpkin seeds!! These are such a yummy alternative to desserts!! Hello! I just made these, but need to know a nutritional breakdown if possible. Do you have a one with the ingredients you used? These bars came out great. I didn’t have chocolate protein powder so I used vanilla and added cocoa powder. 12 bars. Calories per bar 280 kcal. 10 bars. Calories per bar 280 kcal. In future I might try toasting the oats and adding some toasted almond slices! 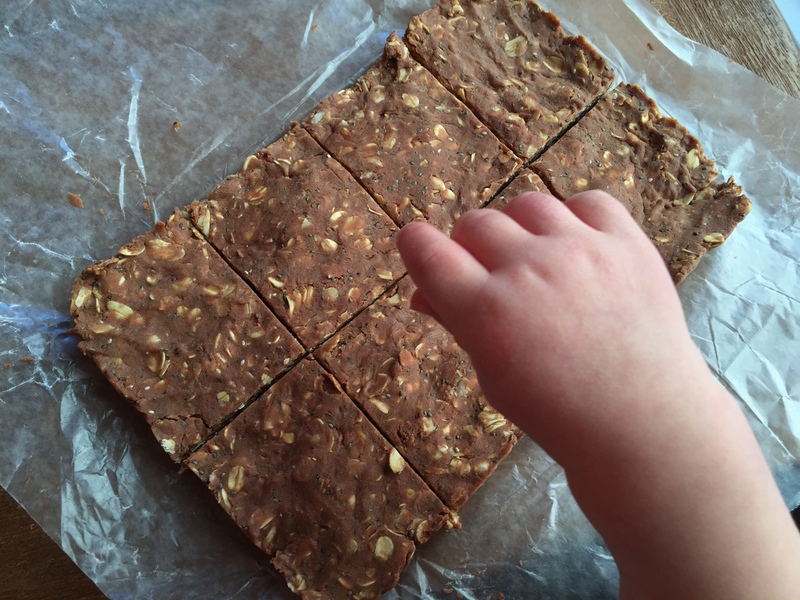 Do you have the nutrition facts for the no bake chocolate protein bars? 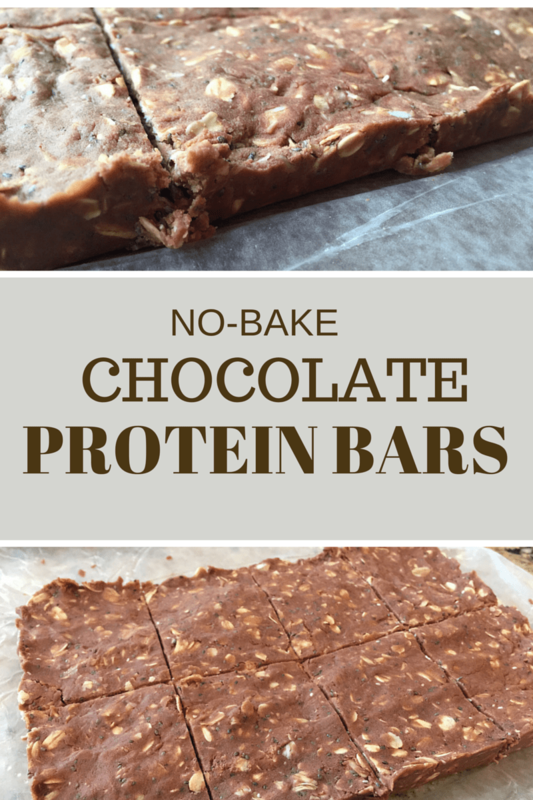 I made these years ago after weightloss surgery while looking for some easy healthier protein bars. Also not to mention saving money on buying super expensive bars. Lol. I used to work in an ER and brought one with me and ended up having to share and make some more so some of the girls could have one for the shift. It had nutrition facts when I originally found this recipe. Would be greatly appreciated if you have them.